Do you have to file U.S. expat tax return as American living abroad? Before everyone gets into Xmas mood and forget about their tax obligations, we still have some time to discuss who needs to file a U.S. tax return! The U.S. expat taxes aren’t easy matter but we try to make it easy to understand even if you never dealt with it before. Check out our new infographic, which explains who has to file U.S. tax return if you are an American living overseas. Do you know that we offer free 20-min tax consultation calls? Book your spot now and get a professional tax help for free! What is a Foreign Earned Income for U.S. expats? 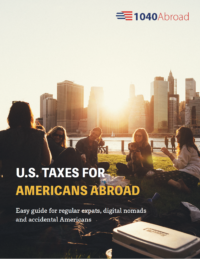 What Does US Digital Nomad Need To Know About Their Taxes?